Realtor Association of Palm Beaches organizes annual Habitat for Humanity events to help build homes for third consecutive year. Volunteers work on homes doing various tasks from painting to wall framing. The association injects itself into the community by holding various fundraising and community-centric events with local organizations throughout the year. Selling a home is a hard feat, but building one might be even harder. 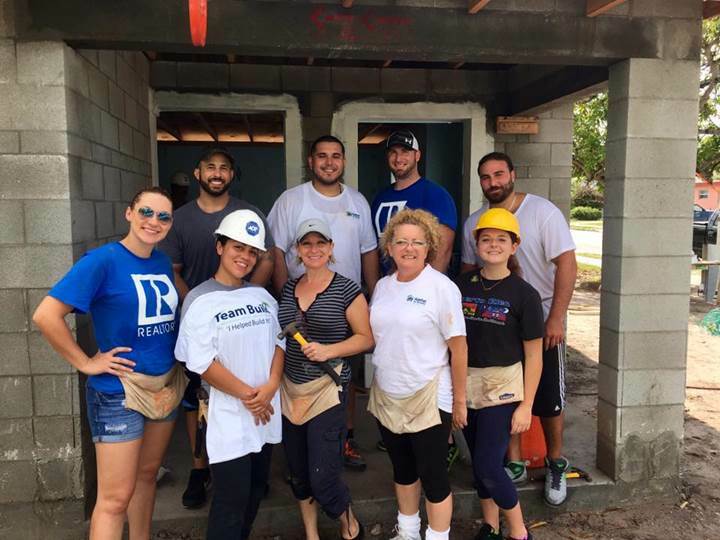 For the third year in a row, local agents from the Realtors Association of the Palm Beaches (RAPB) are helping out the community through the Habitat for Humanity of Palm Beach County. Throughout the months of May to June, local agents will be switching gears from selling homes to constructing them. The RAPB will take part in a “Team Build,” which is a day when members are invited to volunteer to assist in building affordable housing with the homeowners of the sponsored properties. Volunteers put their trade skills to the test with basic projects like landscaping and painting to more labor intensive projects, like fence installation and wall framing. A Team Build day is a volunteer day or multiple days that is hosted at an active site of Habitat for Humanity. To host one of these days, an organization must make a financial contribution going towards building affordable homes for low and very-low income families in the community. “We have the opportunity to sponsor multiple homes for Habitat for Humanity each year,” said Judy Ramella, president of the RAPB. Ramella is also a broker associate with Continental Properties in West Palm Beach. “Habitat for Humanity creates affordable housing, revitalizes neighborhoods, and encourages the pride of homeownership,” she said. Volunteers from the Realtors Association of the Palm Beaches. Back Row (Left to Right): Stanley Vorsteg III, Director and Southern Community Outreach Taskforce Chair; Henry Norena; Jarrod Lowe, Northern Vice President; Dan Mattar. Front Row (Left to Right): Jessica Wittenbrink, Vice President of Programs; Alexi Sierra, Realtor; Kim Flossie, Northern Palm Beach County Relations Manager; Judy Ramella, President; Amanda Ramella. The RAPB remains active within the community throughout the year by donating time and holding fundraisers for various causes. The Attainable Housing Foundation is one organization the association works with multiple times a year to address housing issues in St. Lucie County. Since 2006, the St. Lucie division of the foundation has given out 62 grants totaling $148,500. RAPB also holds an annual 5k fundraiser with the City of Boyton Beach, bringing in $17,000 to assist in the park’s expansion. Which US cities rank as the world's greatest cities on water?